Having reliable simultaneous interpreting equipment for an international conference, a visit by foreign dignitaries, or an expo is a priority for any event planner or conference organizer. If you want your international event to run smoothly and seamlessly in the native language of every participant, Bromberg is your best choice. We provide simultaneous interpreting equipment for meetings, conferences and site visits. Bromberg offers a full range of rental equipment to suit your needs, from booths for large events to wireless and portable devices for any event held on the go. 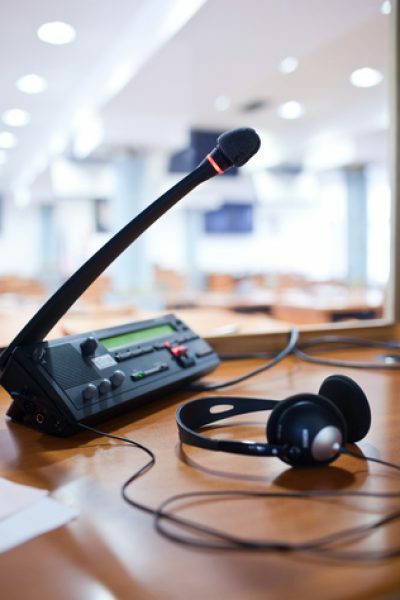 Top quality interpreting equipment is crucial for a successful performance in front of a global audience, and is directly linked with your company’s image and growth. All of our devices are manufactured by top brands, easy to use, and perfect for any size meeting. Contact us today to find out more about our devices and prices here or get a free Simultaneous Interpreting equipment rental quote below.